Corn is an important cereal grain. Along with wheat, rice and potatoes it is one of the most important crops in the world. Corn is actually a grass, but it belongs to the group of cereal or true grains group, which includes wheat, barley, oats, rice and rye. Corn in Montana is raised primarily for livestock feed. In 1995, Montana farmers raised 1.9 million bushels of corn grain and 760,000 tons of corn silage. Nearly all of Montana's corn is produced in south central Montana. A typical bushel of corn weighs 56 pounds and contains about 72,800 kernels. From one bushel of corn a variety of products can be extracted. Silage is fermented corn and is fed to animals. 68,000 acres of silage corn are grown in Montana. Bushel corn is usually ground or rolled and either mixed with other feed or fed alone. Table corn, the kind people eat, is actually a small percentage of all the corn raised. Consumers actually eat a smaller amount of whole kernel corn than the corn found in processed foods. Processed corn is found in hundreds of food products. Some examples are baby foods, bakery products, chewing gum, pudding, flours, gravy, salad dressing, soup, powdered sugar, marshmallows, jam, peanut butter, ice cream, and cheese spread. Some non-food items in which corn is found are batteries, detergents, crayons, fireworks, paint, film, tires, aspirin, candles, soap, and antibiotics. 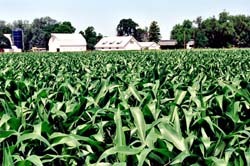 Corn is planted in the spring and harvested in late summer or early fall. During the summer it may grow from three to five inches every day. A mature corn plant may be three to ten feet tall and is made up of a stalk, leaves and ears. The stalk is made up of tough material on the outside and contains soft material inside called pith. At the top of the stalk grows the tassel. It contains hundreds of small flowers which produce pollen. The leaves are found at each joint of the stalk. They are long and pointed at the blade. The ears grow where the leaves join the stalk. A corn plant may have anywhere from one to eight ears. Each ear is made up of a corncob covered with kernels. The kernels are actually the seeds of the plant and the part we eat. Some varieties of corn are used for popcorn and we pop these kernels. *Thank you to the National Corn Growers Association and Agriculture in Montana Schools for providing much of this information.